There is a wide divergence of views on Russia’s economic future. The pessimists project near zero growth (e.g. SWP, Guriev & Zhuravskaya), or even a renewed collapse if Europe goes haywire. The inventor of the BRIC’s concept (and Russia bull) Jim O’Neill of Goldman Sachs believes it will manage to eke out growth of 7%, nearly recovering the output lost in 2009. The consensus seems to be around 4-5% (World Bank, bne). In this post I’ll describe developments in Russia’s economy since I last did it in a systematic way in December 2008 and give some indicators of what to expect in the next few months and years. Most of this post is based on the information in the World Bank’s Russian Economic Report #22: A Bumpy Recovery. 1. 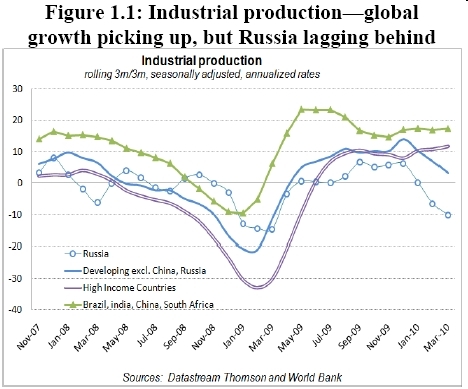 After the sharp -7.9% contraction in 2008, Russia has began to recover at a slower than expected rate, with GDP rising by 2.9% in Q1 relative to the same period last year (in comparison with China’s 11.9%, Turkey’s 11.7%, Brazil’s 9.0%, India’s 8.9% and Mexico’s 4.3%). However, there are indications it accelerated in Q2. The slowness and bumpiness of the recovery is presumed to be due to the waning of crisis stimulus spending and continuing low demand. The current recession was also significantly deeper and longer-lasting than the 1998 one, though its humanitarian impacts were almost insignificant (see later). Also, the recovery has been uneven across sectors. Tradables and manufacturing sprang back very quickly in Q1 (as well as transport and comms), but retail stagnated and construction fell by 9%. However, the latest April (and May) figures show an improving performance in retail and construction. Demand grew slowly on the back of recovering wages, but remains low due to sluggish credit activity and higher unemployment. Investment remains depressed, falling -4.7% relative to the same period last year in Q1 – “most enterprises appeared to be increasing their utilization rate of existing capacity while restocking inventories”. Summary. Amid heightened global uncertainties, Russia is experiencing a bumpy recovery. Domestic demand is rising, but with high unemployment and limited credit and investment activity. Budget execution is better than anticipated due to higher oil prices. Implementing fiscal consolidation is a key medium-term policy objective. Dilapidated infrastructure, especially in transport, could pose serious risks to competitiveness and longer-term growth prospects. 3. Read the Report for the low down on unemployment, current and capital accounts and rollover of external debt obligations by Russian banks and companies. Nothing particularly new or interesting happening there. 4. What is really interesting is the graph of stock of credits to companies and households shown below. Note how the flow of net credits stopped dead in the water after September 2008, after two years of furious expansion. This suggests that Russian companies had become highly dependent on debt-based growth in the years preceding the crisis. As soon as the spigots turned off in late 2008 and global funds flew to safety, there occurred a sharp drop in demand and investment in Russia. Not only did this not happen to the Western developed economies, but they also pursued a drastic monetary loosening (while Russia tightened), which may explain why the GDP declines in countries like the US or UK were much more modest than in Russia (despite their much larger stocks of debt relative to GDP). On the positive side, Russia’s inflation rate has sunk to a record low level of just 6% in its post-Soviet history. 5. Russia’s fiscal position remains strong, as according to Ministry of Finance estimates “the consolidated budget had a surplus of 2.5 percent of GDP” in Q1 2010 (this should be compared to deficits of 10%+ in the US and UK). On the downside, the World Bank notes that the tremors emanating from Club Med may torpedo oil prices yet again, thus widening Russia’s deficit in a few months. 6. Big Russian stimulus spending on social measures such as wages and pensions greatly alleviated the humanitarian impact of the crisis. They are now being phased out. “The focus on people’s incomes has helped mitigate the social impact of the crisis, but at the expense of greater rigidity in the expenditure structure and infrastructure expenditures”. 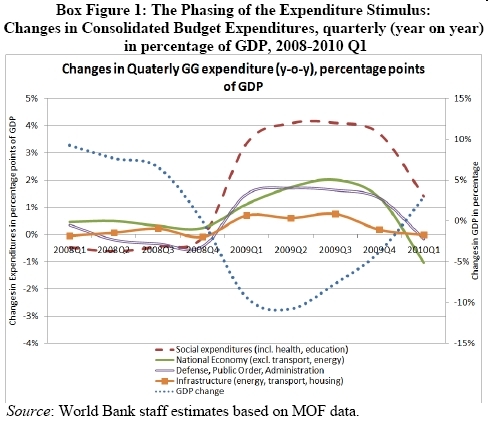 The World Bank points out that it might have been wiser to direct some of that spending towards addressing “acute infrastructure bottlenecks, [which] could have much larger fiscal multipliers”. Despite the withdrawal of most stimulus measures, it is predicted that a planned 46% pensions hike by end 2010 will cause the federal budget to remain well in the red at -5.4% of GDP, but slightly lower than the -5.8% of 2009. The downside is that infrastructure spending, especially on roads, is to get deferred again. The Report has a one page spread on the state of Russia’s infrastructure, which isn’t anything to write home about. Nonetheless, as I argued here, it almost certainly isn’t infrastructure constraints that are going to constrain Russia’s future growth… and in any case it is not clear why spending a lot of money on improving roads at this point in history (of peak oil, climate change, etc) is a great idea. 7. So what will happen if Europe goes haywire? Encouragingly, unlike in the last crisis, the costs of ensuring Russian debt hasn’t been spiking. This may not be a high bar to overcome, but it would be apt to point out that Russia is no longer assumed to be a weak link in the chain like Greece or Spain by global investors. (Indeed as Ben Aris argues in Rerating Russia its credit-worthiness is now higher than most of the developed world’s). Summary: The debt crisis in Western Europe has sharpened downside risks to global recovery and oil prices. But the impact on Russia is likely to be limited because of Russia’s better fiscal and debt positions and limited trade and financial linkages with the affected countries. Taking into account global developments and assuming no default/restructuring and no broader contagion in Europe, Russia is likely to grow by 4.5 percent in 2010, followed by 4.8 percent in 2011 as domestic demand expands in line with gradual improvements in the labor and credit markets. Employment situation is expected to improve only gradually with attendant reductions in poverty. 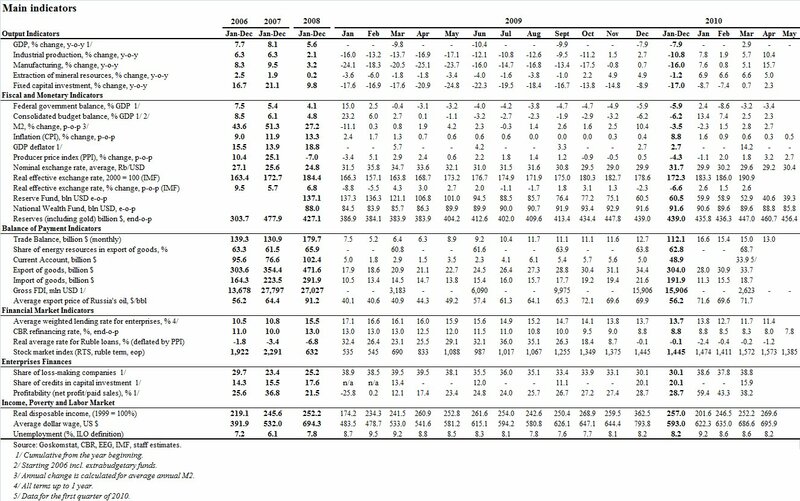 Below is a table showing projected growth for different regions. 9. Despite the World Bank’s concerns that Russia may be becoming too free with its wallet – which may put it into a dangerous situation if oil prices collapse and remain depressed for a long time (but which they are unlikely to do because of peak oil) – as things stand Russia is in an enviable fiscal position relative to practically all developed countries. 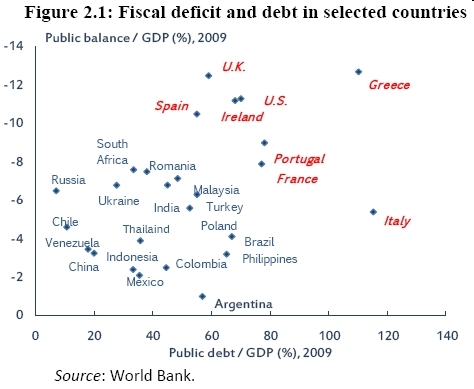 [Note that Japan, with a debt to GDP ratio of about 220%, is literally off the graph]. Funny, isn’t it, how it is almost all Western countries that are in a fiscal pickle. In contrast, the Russia (of kleptocrats), the China (of bad loans) and Venezuela (of spendthrift populism) are facing a sovereign debt apocalypse really well off comparatively speaking! Below is a graph showing the composition of Russia’s GDP growth drivers. The World Bank projects a deterioration in the current account as imports pick up and a rise in the capital account “if the European debt crisis has no significant contagion effect”. Furthermore, “an increase in fiscal revenues due to higher oil prices is likely to be partly offset by new expenditure pressures from additional social spending and increases in pensions”. As a result, “we project the fiscal deficit at 4.6 percent of GDP in 2010 and at 3.8 percent in 2011, taking into account additional pensions expenditures.” Inflation will be at 7-8% and “large banks and corporations should be able to finance or roll over their debt obligations in 2010”. 11. I already pointed out that the humanitarian impact of the 1998 crisis was much larger than of the current one: “While the percentage of the population barely making ends meet went up from 29% in July 1998 to 40% in December 1998, this figure remained stable at around 10% throughout the recent crisis”. This is reflected in Russia’s official poverty stats, whose non-rise was “a reflection of the unemployment increasing less than initially feared and likely also due to increased transfers to the population”. Summary: Monotowns present complex challenges for diversification and social and enterprise restructuring in the postcrisis period. Money alone will not solve them. Multipronged market-driven approaches, including active partnerships between the monotown and the private sector, based on good international practice, stand a better chance of success. The case of the East German Bund–Länder-Program, Pittsburgh USA and Glasgow UK are offered as examples of how to revive ailing post-industrial towns. 13. 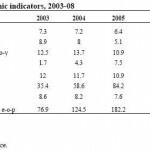 A compendium of Russia economic stats since 2006. 14. Further thoughts. I do think that the European debt crisis will spill over and that there are already numerous signs of a second dip in the Great Recession – this time centered around sovereigns (1, 2, 3). According to quite a few leading indicators, this will probably occur within a few months, i.e. by this September or November. Meanwhile, more dynamic and decoupled economies in the World of the Rest – especially China – are rapidly taking over industrial share from the indebted and aging developed world. They still have plenty of room left to grow so I think they will keep oil prices relatively buoyant (especially considering that global oil production is now falling or stagnating). Russia seems to be in a stronger position than it was in 2008. Though still dependent on foreign debt intermediation, it is now to a lesser degree than two years back, and besides its comparatively excellent fiscal balances will probably mean that global credit flows will not desert it as fully or suddenly as before. The state will remain strong and solvent. Nonetheless, growth will probably slow to stagnation in late 2010-2011 should the events of 2008 be repeated. 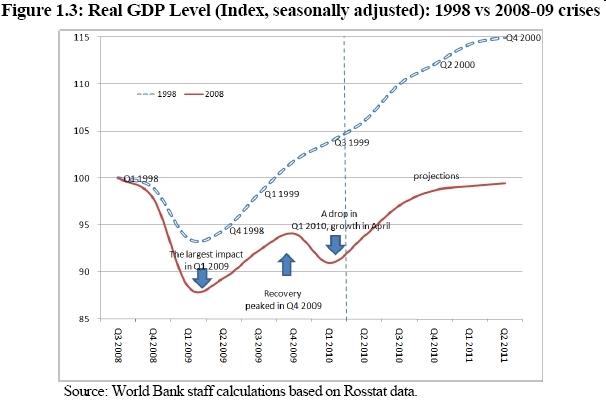 One possible consequence is that Russia’s leadership will become disillusioned by the multi-year, post-2008 failure to lift Russia’s GDP any higher than that which prevailed at the peak of Soviet output, and the end result – within a few years – could be an all-out shift to the “mobilization model” proposed by Gregory Khanin, with the state taking a far more prominent role in forcing modernization from above than is the case even today. Update July 8: It’s worth pointing out that newly released figures indicate that Russian consumer confidence has largely returned to near pre-crisis levels in Q2 2010. This may reinforce the evidence that the recovery accelerated during the period.